RESIZABLE All 2019 model ligatures are resizable. You can easily adjust ligature size with a standard 1.5mm hex wrench. Now, you can make a ligature perfectly fit to your current or future mouthpieces. If you need a tool, you can buy our resizing kit for online shop. HANDCRAFTED AGLETS Beautifully matched to main body, these metal aglets prevent potential dislocation and deformation of the cord. HARMONIC PARTIALS The first thing you will notice is how free the reed becomes. The difference can also be seen in laboratory comparison tests that clearly show the much more defined harmonic partials of our Ligature, indicating a richer, fuller sound. SOUND ADJUSTMENT SCREW Main screw has a unique mechanism to convert turning torque to pushing force. By tightening less, the sound gets darker and a reed vibrates more. It also compensates thickness of a reed. If a reed is too thin, tightening more makes the reed sound like a thicker reed - and vise versa. AFFORDABLE Introducing a brand new ligature line from Silverstein Works. Continuing the heritage and spirit of The original Silverstein Ligatures, the PRELUDE offers a more affordable choice as a tool to discover an entirely new sound from one's current instrument. 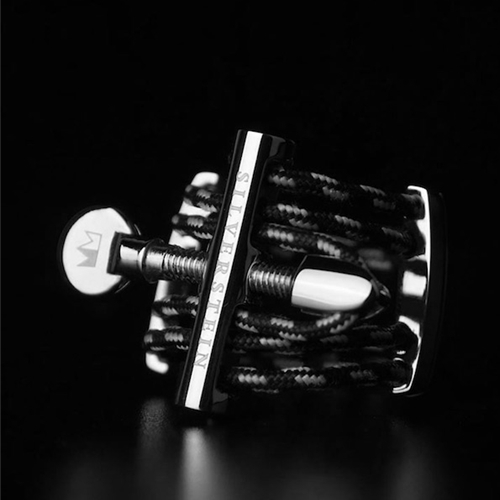 THE INNOVATION: FINE TUNER The new Fine Tuners change how the ligature responds to the vibrations of the reed, tuning the focus and color of your sound to give you unprecedented control and flexibility. With it, you can adjust your sound to perfectly accentuate the music you play at any time. (Additional Fine Tuners are now available for separate purchase.) CRAFTSMANSHIP Each Ligature is hand made piece by piece using the finest materials. The custom cord is created with the same technology and manufacturing process as the cords used on the “Sky Crane” that lowered the Mars Rover onto the surface of another planet. THE 2ND EVOLUTION: DOTTED CORD Interspersed cord with a refined strand – a thinner thread for even less contact and pressure with the reed while maintaining the Ligature’s trademark design and grip. This makes all the difference for greater control, a more dynamic sound, and a richer tone. OMNICAP Come with OmniCap that is small enough to fit in a narrow case, secures and protects delicate mouthpiece tip and reed, protects mouthpiece rail, preserves reed moisture, is easily washable and makes no sound when dropped. ANTI-SLIP PAD The Anti-Slip pads are designed to help prevent slippage of ligatures and scratches for those who need to change instruments quickly in the middle of live performances.